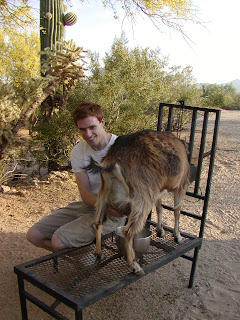 Abe is the first person in a while, who has dared to try milking Holly, our dairy goat. It was not as easy as it I find it to be now. He was really intent! The milk had started to flow at this point. Abe had the hang of milking now. 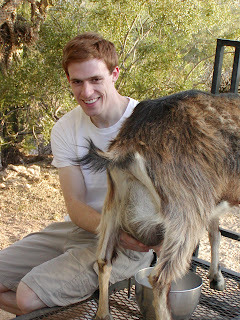 He got off easy, because we are only emptying one of Holly's udders. We are leaving the second one alone for Holly's buck. Anyhow, we are milking Holly between 5:30 and 6 P.M., if you are interested in trying!